We can't believe that it's only been a year since we started the #GoodMuslimBadMuslim podcast - and what a ride it's been! Check out some of our wonderful media hits from the second half of 2015. Thank you for spreading that #GoodMuslimBadMuslim love! Keep using that hashtag and sending us your questions! And if you are in the media, do hit us up - we'd LOVE to talk to you! 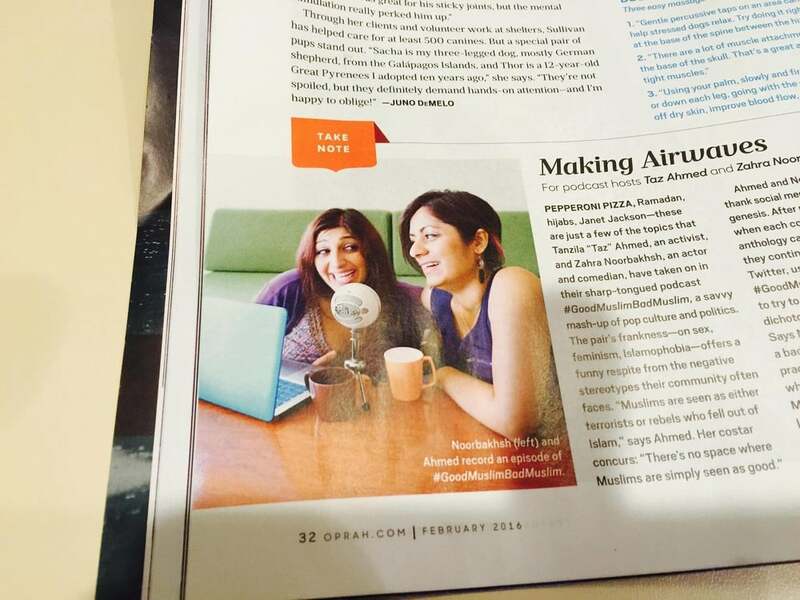 Making Airwaves In February 2016's issue of Oprah Magazine. 5 Women Quashing Preconceptions About Islam on Social Media in December 2015 issue of Wired Magazine. The #GoodMuslimBadMuslim Podcast Hosts Give Dating Advice over on Buzzfeed this summer and it is awesome. #GoodMuslimBadMuslim's Taz Ahmed Shakes Up the Mainstream Narrative in the last issue of Audrey Magazine. Zahra was interviewed by Neda Ulaby over at NPR in What American Muslims Do For Christmas. The Year's Best Underrated Podcasts at Mother Jones. 5 Reasons 2015 Was the Year of the Social Justice Warrior at Salon, Dec 2015. Taz was interviewed for the California Equity Quarterly in an article titled, Advancing Policy and Culture Through Art. Both Zahra and Taz were guests on the awesome podcast Yo, Is This Racist and we spend the whole week talking about islamophobia. Check out ep 740, ep 741, ep 742, ep 743, & ep 744. #GoodMuslimBadMuslim is Essential Listening for All Americans Everywhere by Rohin over at The Aerogram. Zahra was a guest on the awesome podcast Radio Survivor Episode #21. Taz was a guest on the radical podcast The C.O.W.S. talking about why she doesn't date white men. The AV Club in their Podmass suggests the Muslim-ish episode for listeners everywhere in Oct 2015. Paper Magazine lists us as one of their 10 Podcasts to Listen To. Taz was on a panel at the Online News Association 2015 conference this summer called Black Twitter and Beyond - and you can watch the whole panel here. On October 23rd, 2015 Zahra was the Angry Reader of the Week over with our pal Angry Asian Man. Zahra was listed as one of the 12 Emerging Feminist Game Changers over at Nat.Brut. Taz was interviewed for the IBT piece Why Are We Still Asking Muslims to Condemn Terrorism? We were listed in Marvin Yueh's Top 5 Podcasts hosted by Asian Americans in 2015.